You're a heart breaker! Perfect for boys and girls (just switch out the colors) of all ages! The letters are filled stitch, so no tedious cutting of applique fabric. Same look, less fuss! 4x4: 3.87 x 2.76. SC: 8960. 5x7: 4.91 x 6.96. SC: 18,124. 6x10: 5.91 x 8.37. SC: 23,339. 8x8 or Durkee Hoop: 7.81 x 5.52. SC: 21,766. You're a heart breaker! Perfect for boys and girls (just switch out the colors) of all ages! 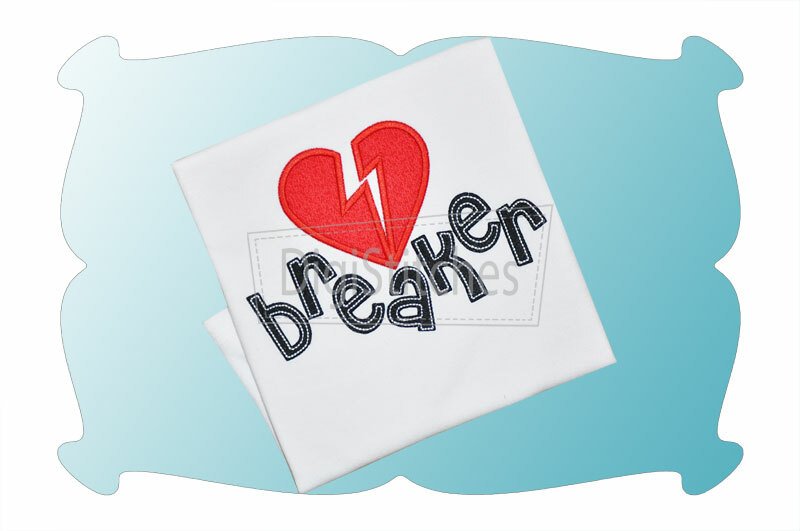 The Heart Breaker applique comes in 4 sizes. All sizes included with your purchase!